Most of Australia’s gold is recovered and removed from open-pit mines. Yet there are still some Australians and others that believe they can find that one, enormous gold nugget that will make them rich beyond measure. This believe is not completely fantasy and not entirely misguided. In fact, 8 of the World’s 10 Largest Gold Nuggets have been found in Australia. There are still others that just happen to find fortune by sheer luck. The most recent jackpot found in Australia is the “Ausrox Nugget”, a spectacular chunk of gold that was found with the help of a metal detector. The Ausrox Nugget weighs in at around 51 pounds, roughly the size of a basketball but much heavier. It is currently the 3rd largest gold nugget in the world. It was located in Western Australia in April 2010. Little can be found about the individuals that located this marvel. Only that they were 3 unsuspecting prospectors that stumbled upon this nugget while out in the Eastern Goldfields of Western Australia with their handheld metal detector and a small tractor. The discovery of this amazing nugget has captivated the imagination of the Australian population and rejuvenated interest by small-scale prospectors to get out in the bush and search for gold. It is known that the nugget sold for over 1-million dollars. The size of the Ausrox Nugget alone makes it remarkable. However, it is even more valuable because of the irregularity of its shape, it’s purity, and it’s beautiful shape. The Ausrox Nugget is 92% pure gold! This is an exceptionally pure nugget, though Australia is well-known for producing high purity gold. 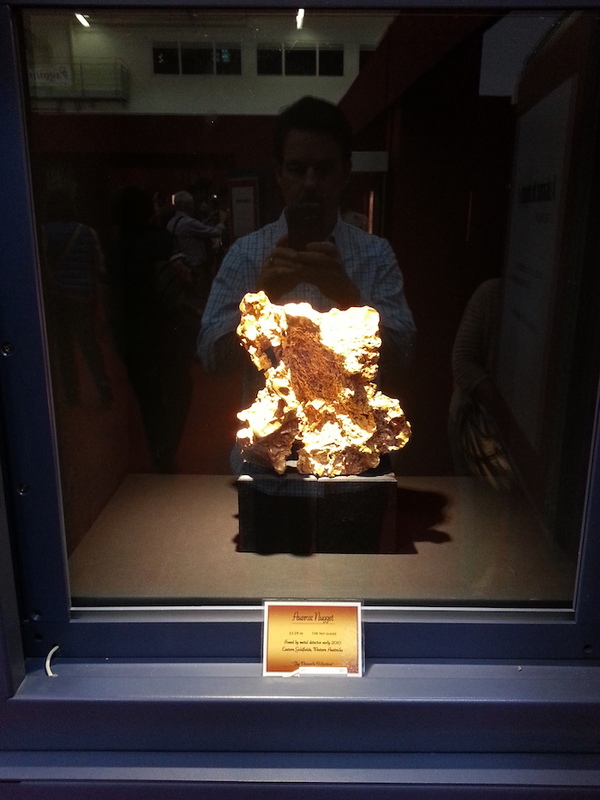 The Ausrox Nugget has been displayed in Western Australia, Houston, and most recently has returned home to the Perot Museum of Nature and Science in Dallas, Texas. This article highlights some photos of the nugget in various locations on display around the world provided to us by the current owner.